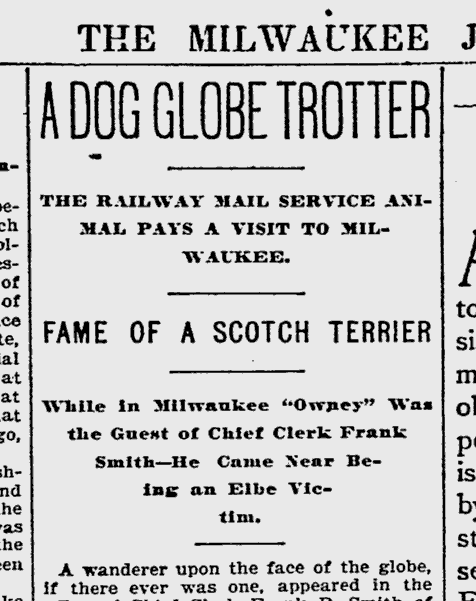 In 1895, a globetrotting mixed-breed mutt named Owney paid a brief call on Milwaukee. As was his custom, the dog arrived aboard one train and departed a few hours later by another. His home was anywhere U.S. mail traveled by railroad – and in the 1890s that was everywhere. The Milwaukee Journal reported Owney’s Milwaukee visit in 1895. 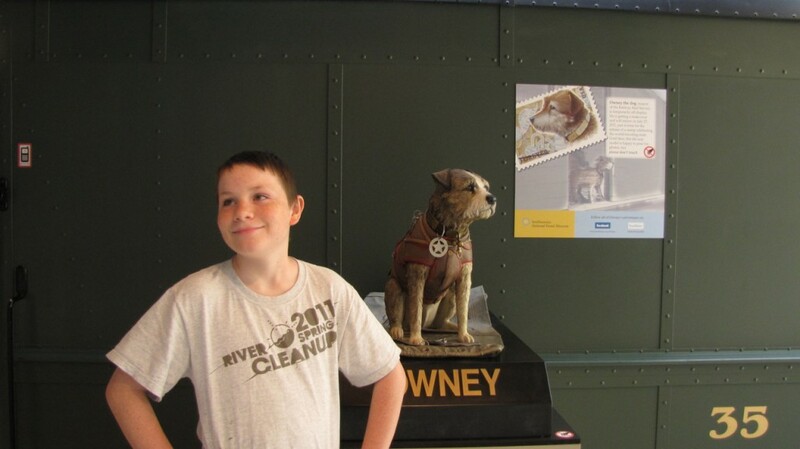 According to the National Postal Museum, Owney was a scruffy puppy when he appeared at the Albany, N.Y. Post Office in 1888. Adopted by the clerks, Owney made his home at the post office thanks to a kind-hearted supervisor willing to overlook regulations. 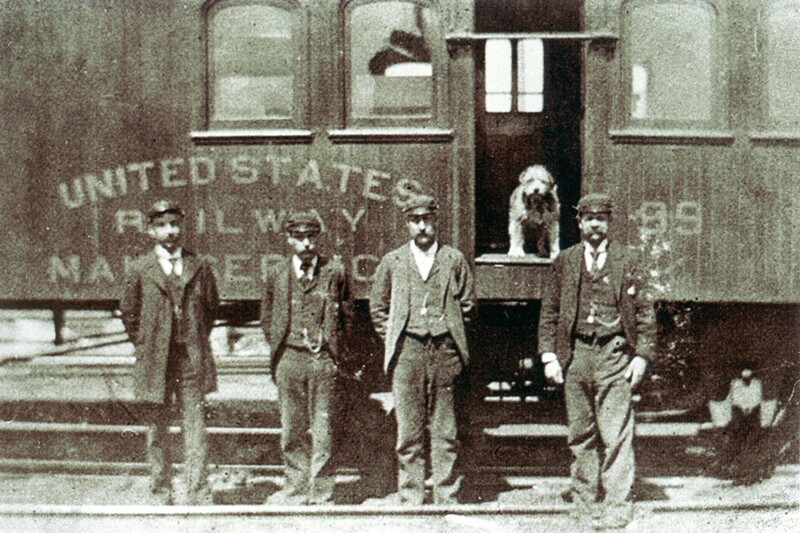 Heeding the call of the open road, Owney soon started riding mail wagons and then Railway Post Office (RPO) train cars. RPOs were specially designed rail cars coupled to passenger trains. As the train moved along, Railway Mail Clerks in the car would systematically sort the mail for destinations along the line. At places where the train didn’t stop for passengers, a clever contraption allowed bags of mail to be taken aboard from trackside hooks “on the fly.” At the same time, clerks would heave sacks of mail destined for that town off the moving train. It was an efficient operation and mail service could be astoundingly fast. One could walk down the passenger platform at New York’s Grand Central Terminal, drop a letter through a slot on the wall of the appropriate RPO, and be assured it would be delivered in Chicago the next day – all for the price of a 3-cent stamp. The nationwide network of RPOs became Owney’s home for the remainder of his life. He would hop off one RPO at a station and randomly climb into another and curl up on a pile of mailbags knowing wherever he went the clerks would take care of him. 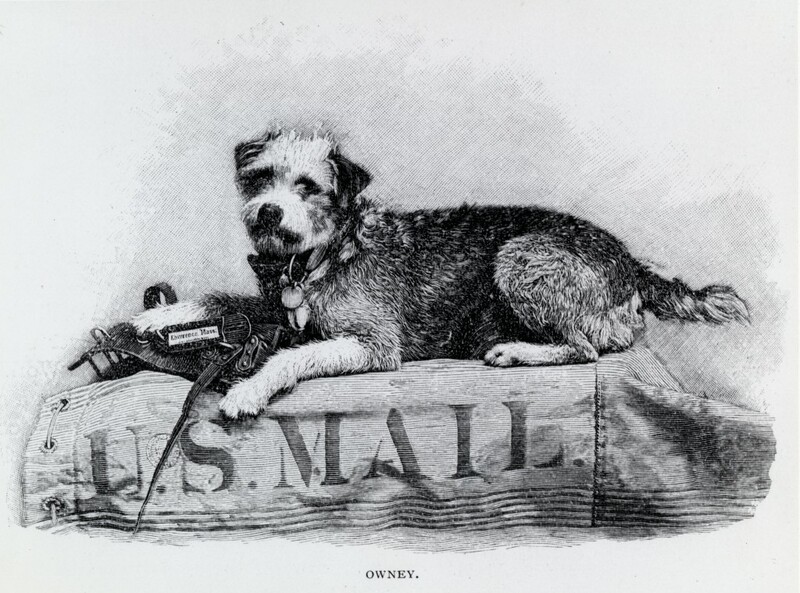 Concerned the tags were a burden for the little dog, U.S. Postmaster General John Wanamaker had a custom harness made for Owney – and also named him the Official Mascot of the Railway Mail Service. In 1895, a few months after his visit to Milwaukee visit, Owney made an around-the-world trip. Starting from Tacoma, Washington in August, he traveled with mail bags throughout Asia, North Africa, the Middle East, and across Europe, before returning to New York City on December 23 and, finally, to his Post Office friends in Albany. Owney’s death was a sad one. In June 1897, he hopped off a train in Toledo, Ohio. It seems a postal clerk chained Owney to a post while waiting for a newspaper reporter to arrive. Not used to this kind of treatment and possibly becoming ill-tempered in his older years, Owney bit the clerk on the hand. The local postmaster ordered Owney put down. A Toledo police officer led the dog into an alley and shot him. Owney had traveled 143,000 miles in his lifetime. His death made national headlines, and triggered widespread anger. The Chicago Tribune termed it “an execution.” Mail clerks around the country donated funds to have Owney’s remains preserved. He was placed on public display in the Post Office Department′s headquarters in Washington, D.C. In 1911, Owney became the property of the Smithsonian Institution. A century later, in 2011, Owney appeared on a U.S. postage stamp. Today he occupies a central place in the atrium of the National Postal Museum, wearing his famous harness and surrounded by a few of the estimated 1,000 tags he accumulated in his travels. One of the many tags in the Smithsonian’s collection is made of brass. It reads “Milwaukee license no. 694,” and granted Owney the freedom to roam the city.